April Cushing is the Adult and Information Services Supervisor at the Morrill Memorial Library in Norwood, Mass. Read April’s column in the March 29th edition of the Norwood Transcript & Bulletin. I spent some time behind bars recently. It was my second stint in the slammer in three years, and I don’t plan on returning any time soon. I’m talking about my recent trip to Alcatraz while visiting my daughter and son-in-law in San Francisco. I had a macabre desire to tread the concrete and steel corridors of the most notorious prison in America one more time. The ferry departed from Pier 33 in mild-for-March sunshine for the 1.4-mile trip to The Rock. Minutes later, buffeted by a raw wind, we were completely enveloped in fog. 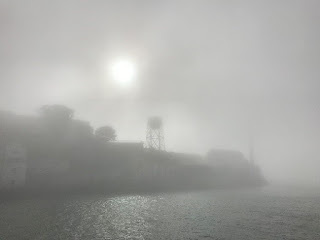 Not until we arrived at the Alcatraz dock did the fortress materialize through the mist. As I trudged up the hill to the main cellblock, the chill I felt wasn’t just from the cold. I thought of the island’s three most infamous inmates—Al “Scarface” Capone, Robert “The Birdman” Stroud, and George “Machine Gun” Kelly–making that same trek, only in handcuffs and leg irons. And with no round-trip ticket back to the mainland. Thousands of years before the most hardened, incorrigible convicts in America were imprisoned on “Hellcatraz,” Native Americans paddled out to the island to fish and collect bird eggs. In 1775, Spanish sailors came across the 22-acre landmass and named it Isla de los Alcatraces after a species of cormorants found in Spain. After the U.S. acquired California from Mexico, the first lighthouse on the West Coast was built on Alcatraz in 1854 to guide ships into San Francisco’s harbor at the height of the Gold Rush. That same year, construction began on an army post and Hopi Indians and Civil War convicts were detained on the island. In 1907 the military fort closed and the “disciplinary barracks” became a minimum-security prison. When FBI director J. Edgar Hoover announced the need in the 1930s for a “super prison” in which to incarcerate the country’s most recalcitrant criminals, Alcatraz was it. But after only 29 years, the crumbling facility was deemed too expensive to maintain and the last prisoner departed in 1963. The island’s colorful history, however, continued. Beginning in 1969, the Tribes of all Nations occupied the island for 19 months to protest two centuries of mistreatment by the U.S. government. In 1972, Alcatraz became part of the Golden Gate National Recreation Area. The first tourists arrived on The Rock the following year. And almost half a century later, I joined the nearly two million annual visitors to see the legendary penitentiary for myself. Back at Cellblock B, I plugged in to the excellent self-guided audio tour narrated by former inmates and guards. I wandered down the dank corridor lined with three stories of claustrophobic single-person cells, known as Broadway, where prisoners were locked in for at least 13 hours a day—longer when fog obscured the guards’ direct line of fire outside. I jumped the first time I heard the noise of multiple cell doors slamming shut simultaneously. From my trusty Fodor’s San Francisco guidebook I learned that George Lucas recorded the sound of those same prison doors banging shut in his “Star Wars” blockbuster. I see where the term “slammer” originated. Former Alcatraz inmate Jim Quillen described the island as cold, gray, lonely, and haunting. When the wind blew in a certain direction, according to Quillen, you could smell the Italian cooking in North Beach and hear the laughter of women and children, which he admitted was nearly intolerable. Maybe it was better to be enshrouded in fog after all. The day before our Alcatraz excursion, the general manager of the Fairmont San Francisco spotted us ogling the photographs of the hotel’s many celebrity guests and offered us a peek at the penthouse suite–clearly a slow day on the job. The view from the terrace overlooking the bay was spectacular—and terrifying. Upon hearing that Sean Connery tossed the luckless FBI agent over that very same balcony in the 1996 film “The Rock,” we had to snap a selfie. You too can check out that scene as well as another film playing fast and loose with actual facts– “The Birdman of Alcatraz”–at the Norwood Library. I found the accounts of escape attempts particularly fascinating. In the 1946 Battle of Alcatraz, six prisoners hatched a plan to disarm their captors and escape through the recreation yard. Several guards were locked in a cell, but when the key to the prison yard was not forthcoming the desperate inmates opened fire, killing two officers. The Marines were brought in, eventually ending the uprising but inadvertently killing a guard still inside the cellblock. Three ringleaders died during the fighting, two were executed for murder, and a 19-year-old accomplice, whose life was spared, was sentenced to an additional 99 years. Not all the residents’ efforts to, ah, relocate, were bloody. In the most elaborate break-out attempt, three convicts fashioned tools from spoons and made drills with which to widen the vents in their cells leading to the utility corridor. From there they crawled up the pipes to the roof and down a drainpipe to the ground, using a raft made from prison raincoats to navigate the frigid currents to freedom. Their fate remains a mystery. Perhaps the most heartwarming depiction of the prison as playground is Jolene Babyak’s “Eyewitness on Alcatraz,” in which she recalls an idyllic childhood as the daughter of the acting warden. In “Children of Alcatraz: Growing Up on the Rock,” Claire Rudolf Murphy portrays the stark island as a safe haven where families never locked their doors, kids played hide and seek in the prison morgue, and became friendly with some of the prisoners. Whether you’re in the mood for a feel-good story of the sunnier side of Alcatraz or a foray into the most fearsome prison of all time, escape to the Morrill Memorial Library to immerse yourself in the enduring drama of life and death on The Rock.